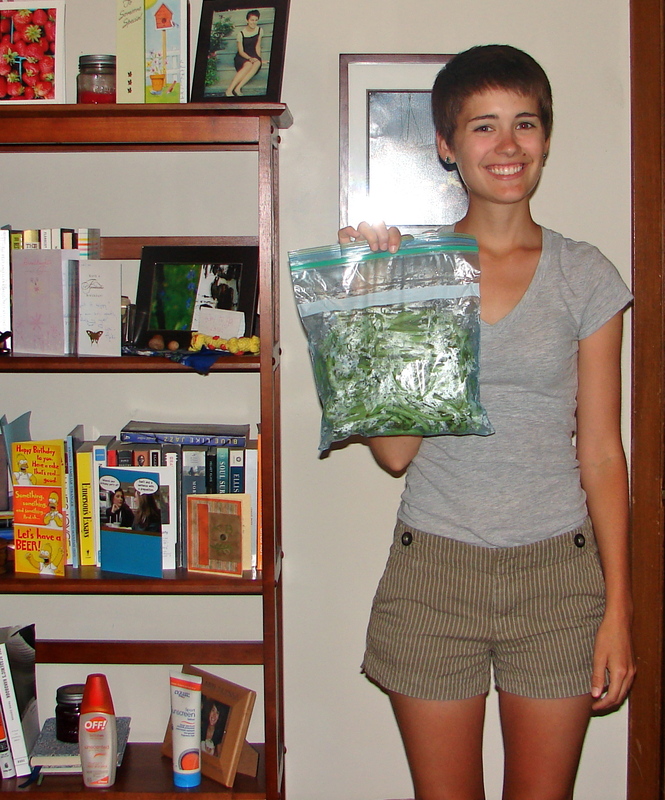 then your aunt and grandma mail you a package of fresh Missouri green beans. You take a picture of yourself with them, because you’re just that cool, and because you’re relatively okay with yourself. Then you wash them and break them and cook them for 5 hours. Then you are pretty happy, because you had green beans for dinner. You also don’t worry too much about varying sentence structures. Maybe H-DOC is the way to go. I had a friend in undergrad who was really into H-DOC, Honest Direct Open Communication, maybe not in that order, I can’t really remember. I think H-DOC sounds great, but I don’t practice it because I don’t like confrontation. Instead, I generally do what’s expected of me and try not to complain about it. Or I just complain to myself. Or a select few friends. I get stressed out, but it usually goes away after awhile. I’m going to do some H-DOC-ing right now, though, because it’s H-DOC about myself, so it can only cause internal confrontation, which in reality, might be the worst kind of all. I am ready to admit defeat. Or at least disappointment. I am listening to “Everybody Hurts” by REM. On repeat. I can’t grow green beans. This is unfortunate because they are my favorite. They are my comfort food, not mac & cheese, not ice cream: green beans. What’s even more unfortunate is that I can’t make myself feel better right now because I can’t eat them because I can’t grow them. What a vicious cycle. Last summer I harvested about 12 green beans. 2 and 1/2 months of work, 12 green beans. I blamed it on the harsh sun and all the deer. When I talked to my family in Missouri last weekend, they said they had already harvested a few “messes” (an official unit of measurement) of green beans. At this point, I only had 2 tiny green beans; I was really excited because it was a sign of progress. When I showed a friend the garden yesterday, though, there was only one green bean. This morning there were less leaves on the plants. I think something is eating them. 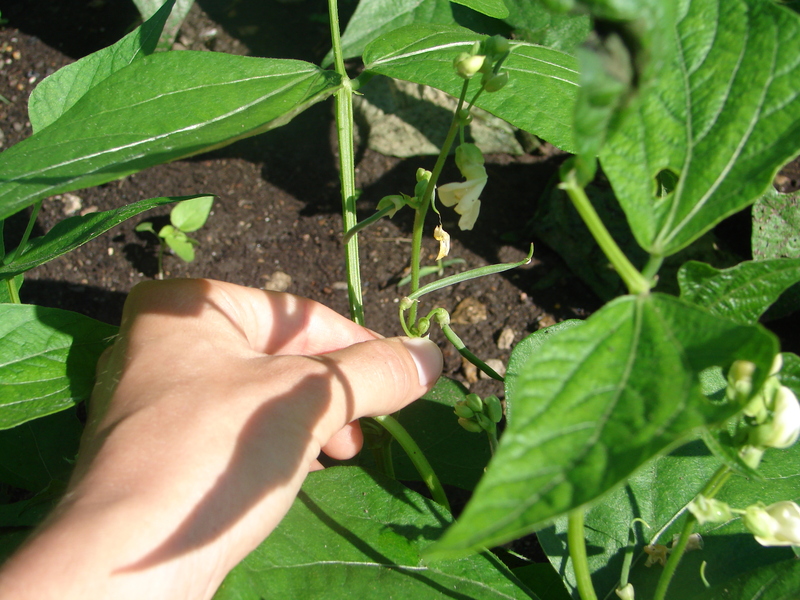 The solitary green bean was still there, and it was big enough to pick, so I did. Judging from everyone else’s experiences, it seems like green beans are the absolute easiest crop to grow. Mid-summer, my grandpa talks about how he has so many green beans that he can’t even keep up with them. 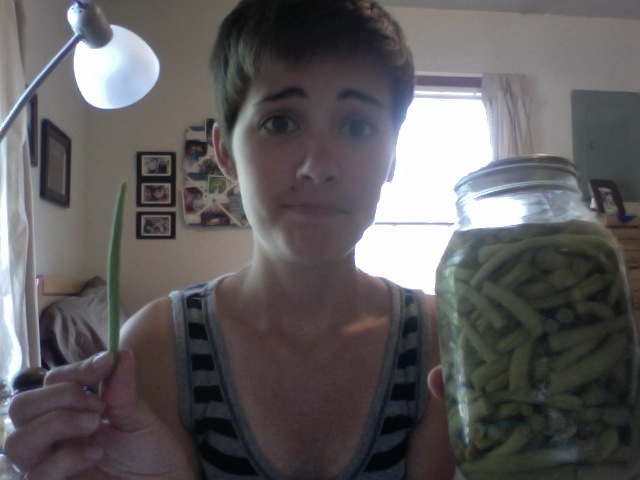 Somehow Grandma Pat manages to can jars and jars of green beans. I think she said she wanted to can 30 quarts this summer. 30 quarts! I can’t even grow enough for one pot. I feel like there’s some green bean secret that no one is letting me in on. I haven’t totally given up. I think I’m going to do that thing where I continue to hope that they will do better. They never really will and at the end of the summer, I will think “well, all along I knew it wouldn’t work.” It’s sort of like in 6th grade when you think the cutest boy is going to ask you to dance, and then he never does. You knew it all along, but you still had hope. Later you see the cute boy from 6th grade drunk at a wedding in a photo on Facebook, and he’s not as cute, and you realize that maybe everything does work out. It really becomes very tangled and very confusing. We’re getting to that point in the summer (Digression: wait, today/tomorrow is “officially” summer…so I guess that “that point in the summer” is actually the beginning of the summer. That’s weird. It feels like it’s been summer forever. ), when the garden stops being neat and tidy. Instead, the plants take over the plot. It does what it wants. It becomes more lively, gets bigger, there are more weeds. It becomes its own living, breathing thing. In reality, this is good since it’s about growth and life and what we learn from those things. I’m a bit of a perfectionist. The plants doing what they want, being in control bothers me. It makes me feel like I am not doing enough. I am trying to embrace it this summer, though. I am trying really hard not to label it a mess, because really, it’s doing what it’s supposed to do. 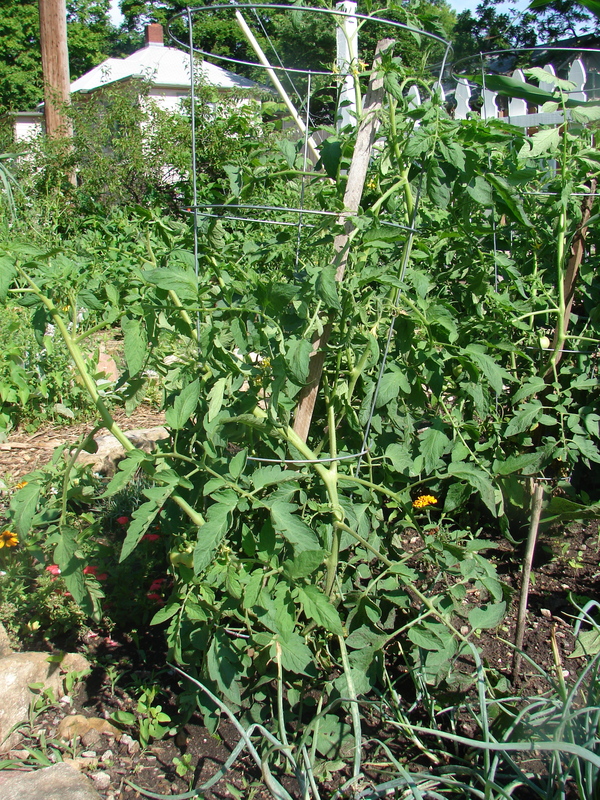 This is a photo of one of the tomato plants; it looked calm, kind in fact, just a few weeks ago. Now the two tomato plants look kind of crazy. They won’t stay in their cages. 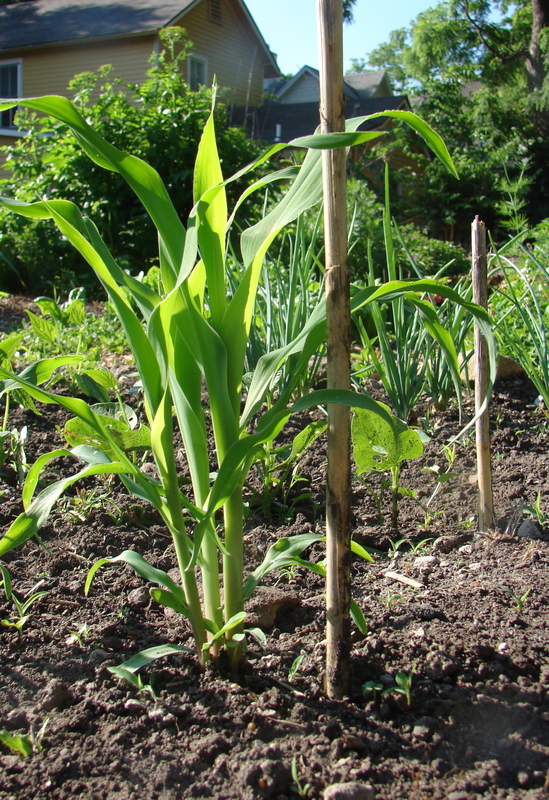 Their arms are reaching everywhere–into the corn, into the flowers, into the shallots. Every few days, I try to bend some of the branches to fit them back into the cages, but this usually just results in me breaking one of the branches; they’re not as flexible as they appear. My next plan is to get some yarn and tie some of the most unruly branches to the cage. 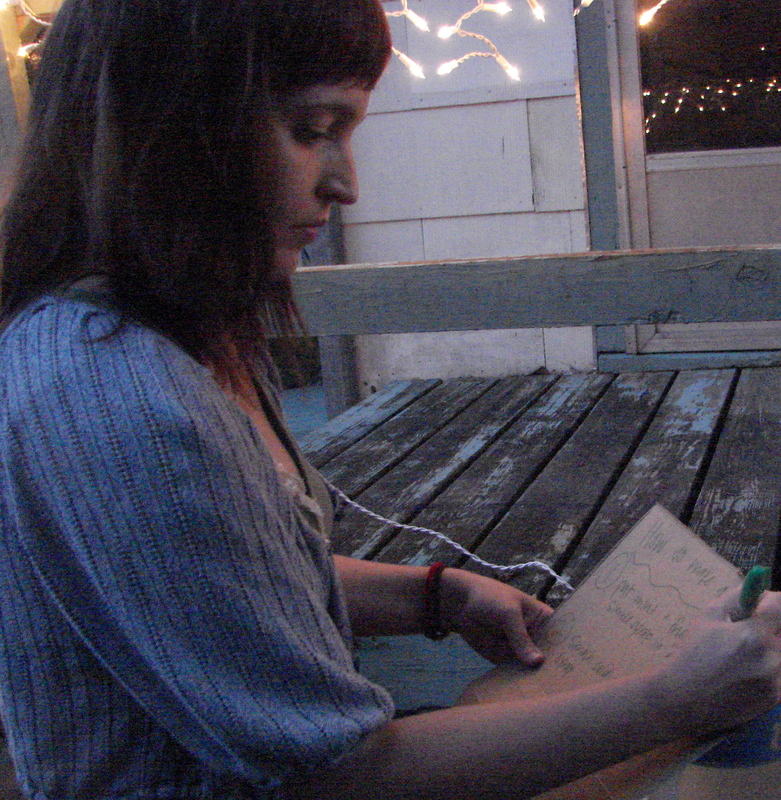 All this crazy-ness is working, though: Amelia counted 12 tomatoes total, 7 on one plant and 5 on another. They’re still very green, though, so now is the time where we just watch. This is a photo of the corn. Knee-high-by-the-fourth-of-July, take that! It’s already up to my shoulders. I checked today, and a few of the plants are actually starting to tossle. I guess I need to research that hand-cross-pollination thing soon. 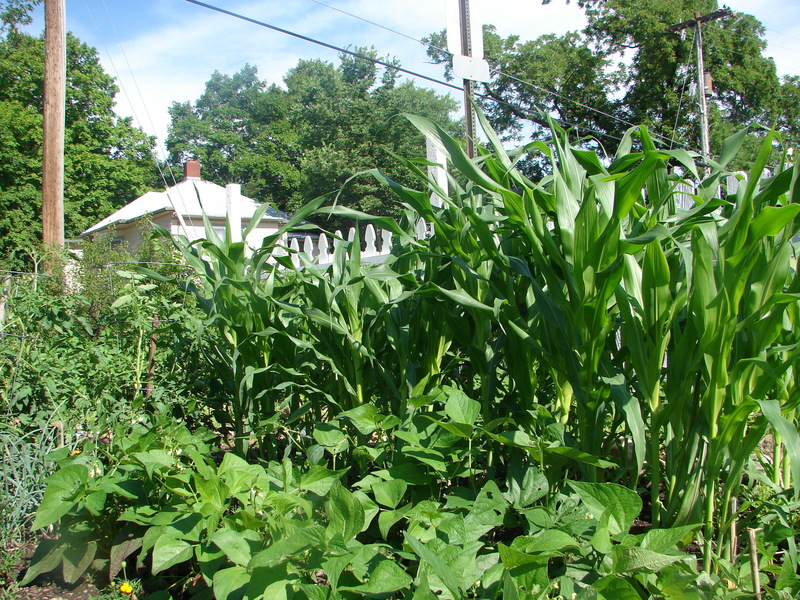 I’m torn about whether or not corn is good for a small plot, because it gets so big. I’ll wait until the end of the summer to make that decision. I’ve thought about it quite a bit this weekend, and it seems like its height is actually good for our plot. You can see the green bean plants at the bottom of the photo. They’re staying really healthy. Part of this is because of the marigolds we planted. I’m amazed that this has worked so well to keep bugs away. Goodbye Sevin dust? I think the other reason they’re doing well is because the corn is shielding them from some of the sun. That shade is probably keeping a lot of the buds from getting burned up. This is just a half-baked hypothesis, but it seems logical. Since we were all giving tours to visitors on Saturday, we couldn’t really see the other gardens on the tour, so, on Sunday June 6th all the gardeners met up. This afternoon/evening was overwhelming. Good overwhelming. It took us 3 hours to look at 10 gardens. Then a potluck. Then a meeting. 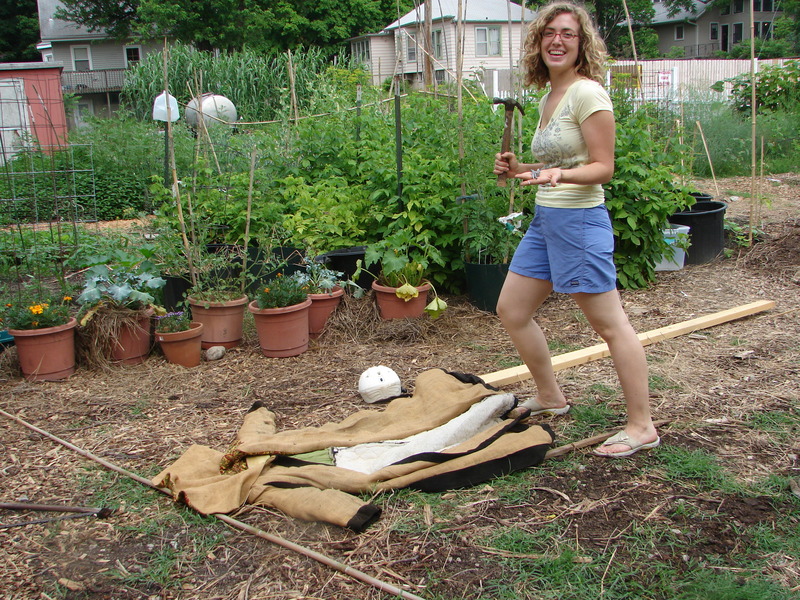 I know how to plant/grow a few basic things–corn, green beans, tomatoes, peppers. I have a general idea of how to do other things–lettuce, cucumbers, watermelon. 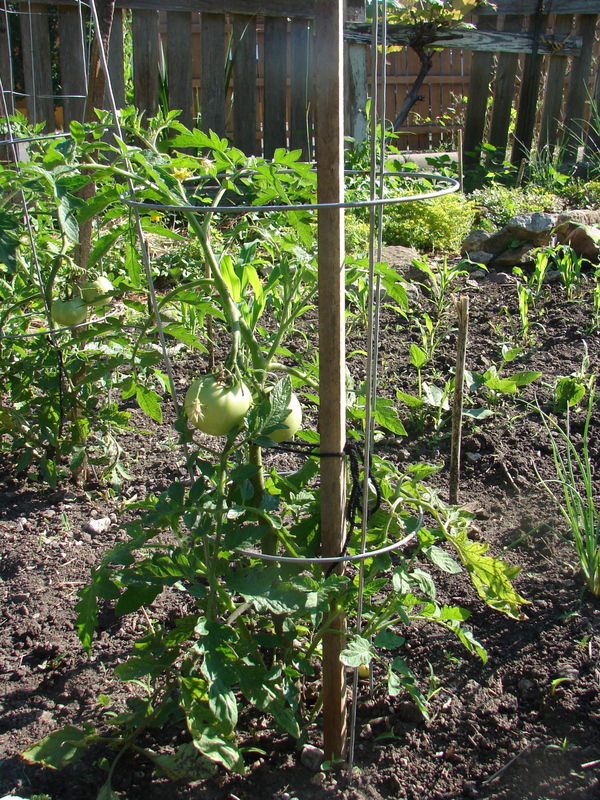 I know the following garden rules: tomatoes need cages, I should water the plants, weeding is important, planting two seeds “ensures” that at least one seed will come up. I do not know about rain water catchment systems, the way that peppers can cross-pollinate with one another and create weirdo hybrids, greenhouse construction, making fruit leather, irrigation, raising and butchering chickens, allowing plants to “go to seed,” the proper way to rotate different vegetables, or selling crops in a CSA. Or at least, I didn’t. I do now…well, sort of. What surprised me the most, I think, is the number of people that do this…and nothing else. Or do this with something else as a side project/job. It’s not just farmers with hundreds of acres anymore. People are doing this. 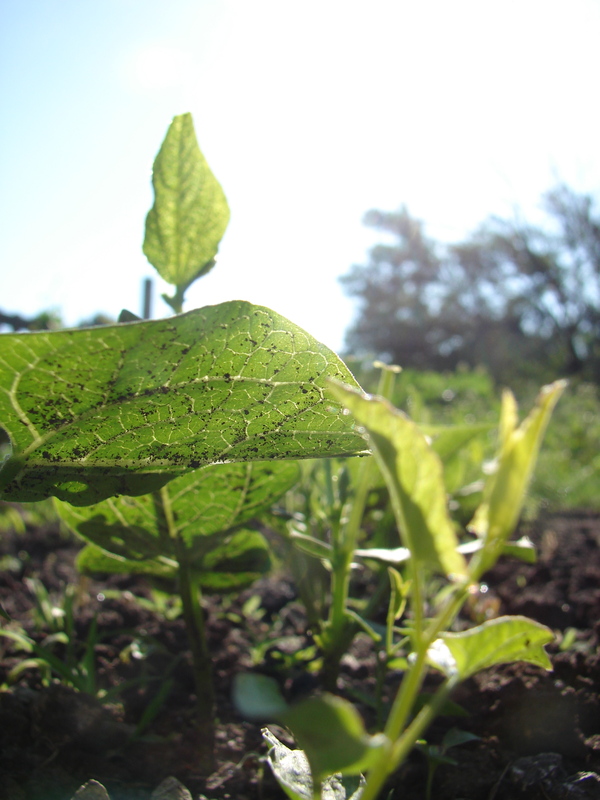 Enter the green/sustainable living/organic/local food movements. I don’t have to explain these movements (or the reasons behind them) to you; you’ve read about them, you likely have an opinion about them. There are tons of reasons for these movements: People are worried about the chemicals they’re putting in their bodies. People are opposed to the conditions imposed on workers in institutions that mass produce food. People are concerned about our effect on the Earth. People want to live intentionally. People miss an honest, genuine connection with the land. People want to know what they’re eating. People value work. Honestly, some people probably just do it because it’s hip. Those “Go Green” shirts are pretty cool…and sometimes even organic. These changes are really noticeable in urban (or urban-ish) areas. 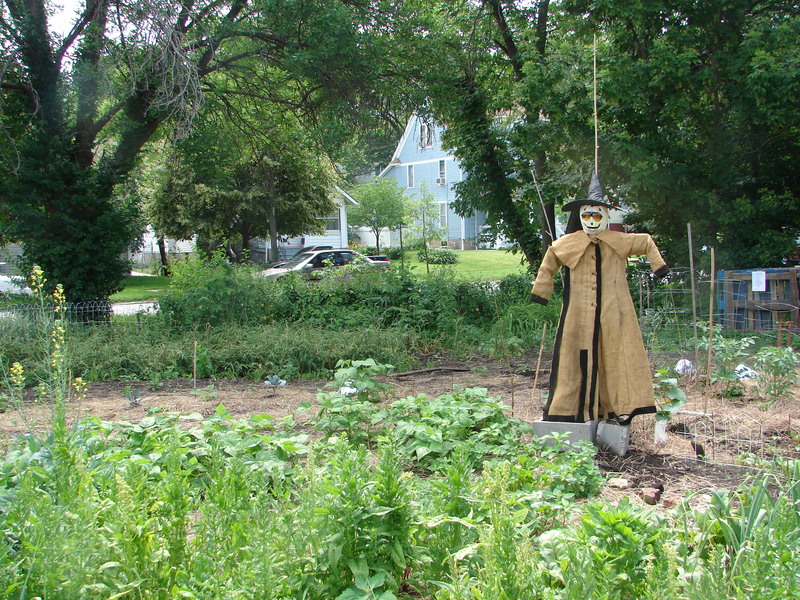 One of the gardeners made the comment during the tour that we’re all urban gardeners. 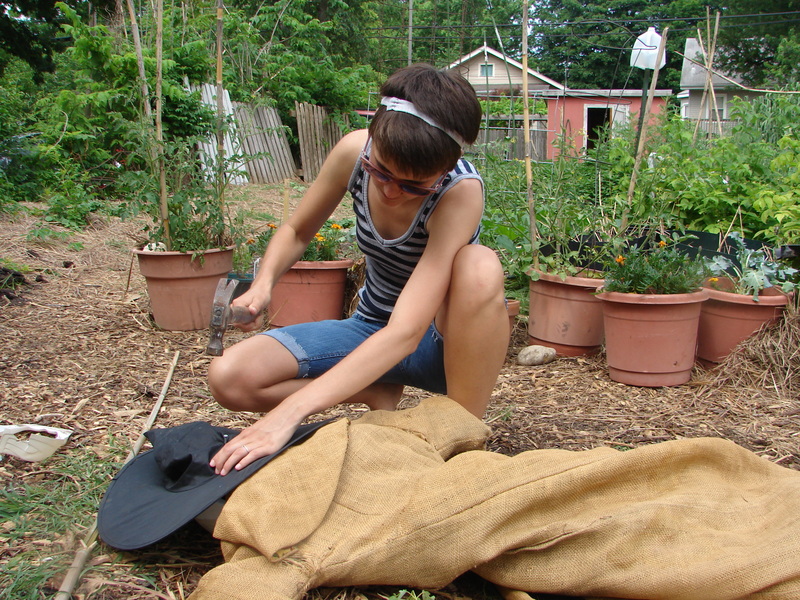 Until that moment, I hadn’t thought of myself as an urban gardener doing something different. I thought I was just a young lady with old lady hobbies (much like knitting or cross-stitching, neither of which I’m very good at) or a young lady who, as a friend recently told me, “lives a different kind of life than anyone else” she knows. This is a compliment, right? While I am in no way ready to pack up my vegetables and head to the Farmer’s Market, I think this guy is right. I learned a lot, and while I’m not entirely sure what that is right now, I think a lot of what I learned is just seeing that this is in fact possible. It might be more expensive or require more work on my part, but honestly I think it’s worth it. The third garden we visited was the one that surprised me the most. 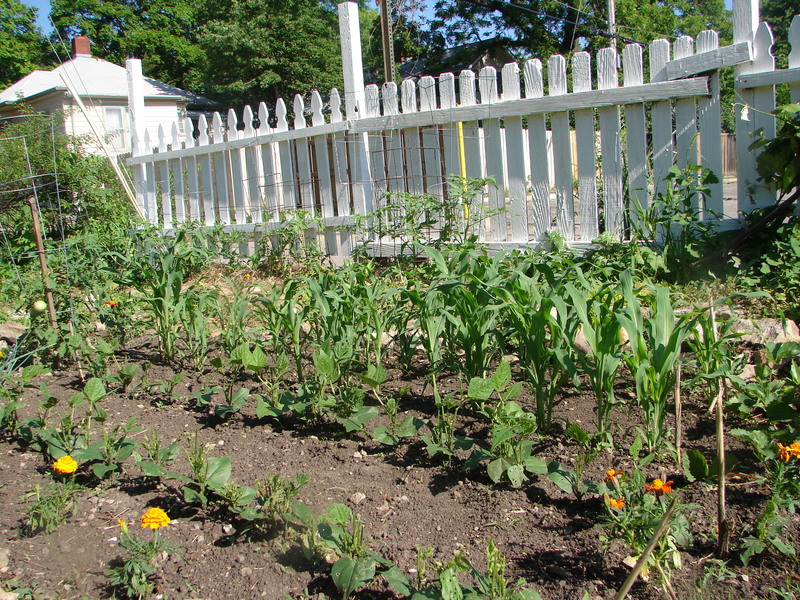 This couple’s entire lot (with the exception of a small play area in the backyard) was filled with flowers, herbs, vegetable plants, even the area in between the sidewalk and the street had food planted in it. The different plots were separated by straw walkways. They had built a greenhouse that was naturally heated and cooled. They also had two kinds of rabbits: 1) Pets 2) The ones they caught in the garden, fed, and then ate. I felt like I was meeting a character from Roald Dahl, except they were nice. So, mint spreads. A lot. 1. Ice water with a stalk of chocolate mint. Not as boring as it might sound. 2. 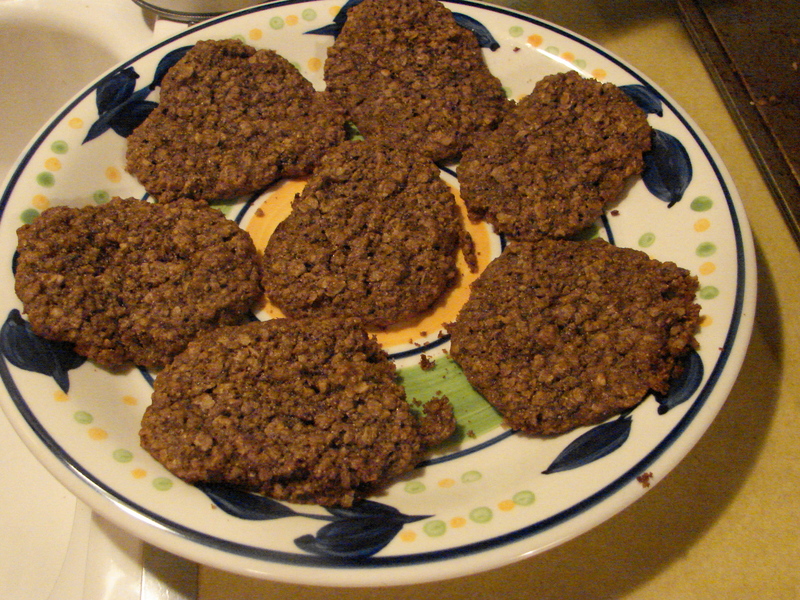 Chocolate Mint Oatmeal Cookies. I kind of made these up. They were sort of weird. Friends said they liked them. I’m not sure what I think. 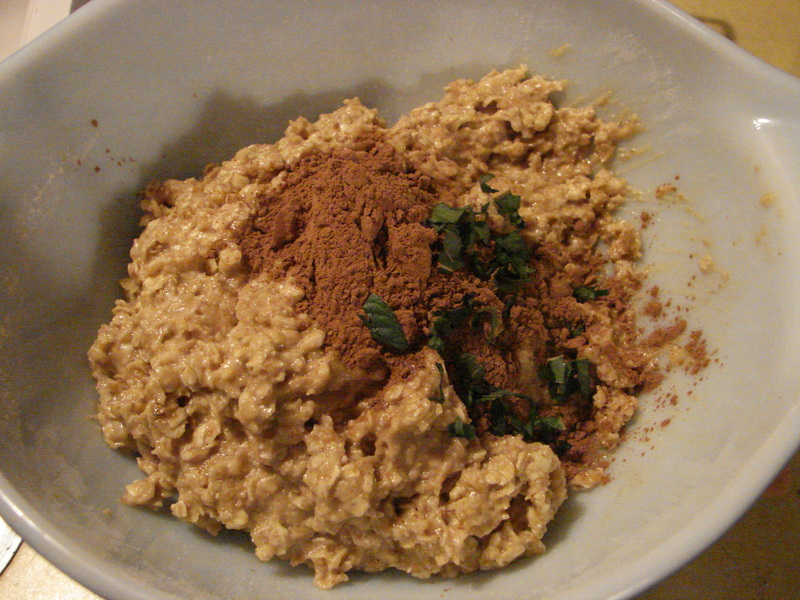 I basically just tweaked Grandma Wiseman’s Oatmeal Raisin Cookie recipe (I think you could use any oatmeal cookie recipe) by taking out the raisins and cinnamon and adding mint and cocoa powder. They tasted really great, but they were…porous. Yeah, porous. I’m not sure if that’s good for cookies or not. I think this is mostly because I used almost all whole wheat flour and not any fault of the chocolate mint. If I made them again, I think that half and half might work instead of 1 full cup whole wheat flour and 1/4 cup of white. worked better. They pretty much fell apart every time I moved them. And since I have poor spatial skills and can never seem to choose the right piece of tupperware the first time, and since I generally give over half of the baked goods I make away, cookies that I make need to be transportable. 3. Chocolate Mint Tea. This isn’t that exciting or difficult. 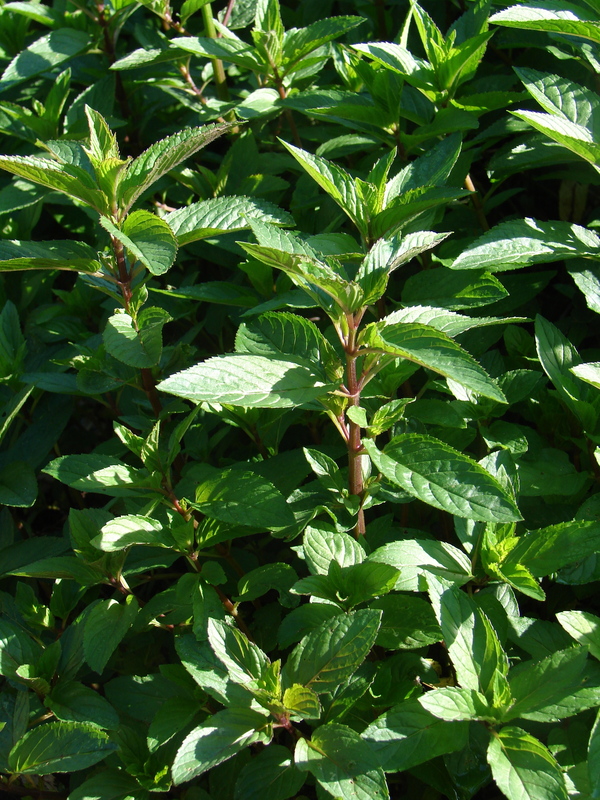 I threw a bunch of mint leaves into a pot of water and then let them boil for about 5 minutes, until the water started to look like tea. I also added 2 bags of green tea to it so that it would have a little caffeine. Then I poured it into a spaghetti sauce jar (because I don’t have a pitcher, and I am in graduate school and don’t want to buy a pitcher) and stuck it in the refrigerator. 5. Birthday cake. 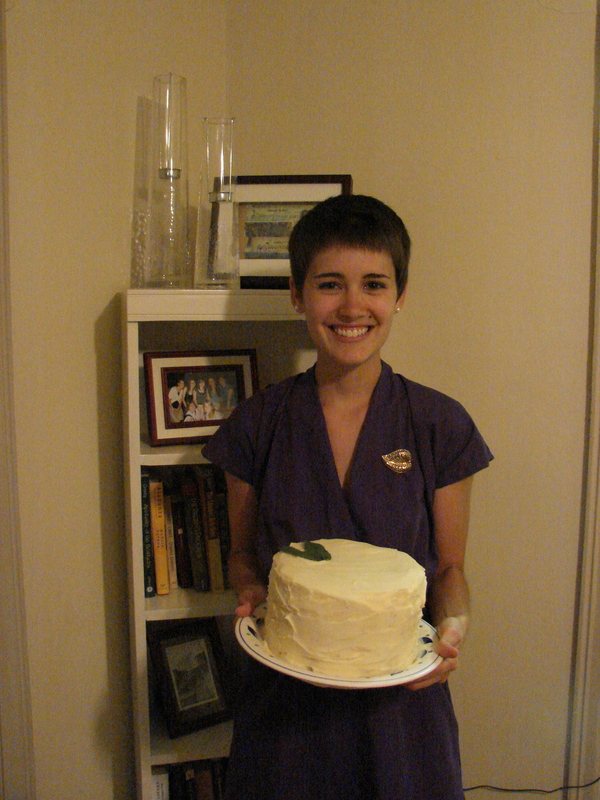 Okay, this is really just an excuse for me to put my birthday cake out in the blog-o-sphere (and to use that word). The chocolate mint is involved, but barely. It comes in at the end. If you’ve known me for many (or any) of my 23 years, you know that the birthday cake is a big deal. You also know that my favorite is simple: white (or yellow) cake with white frosting. Because it’s so important, I spent a little a lot of time (too much?) finding the perfect recipe. Here’s the one I finally decided on: http://annies-eats.com/2010/01/05/vanilla-bean-cupcakes/. I only made one change to the recipe–I used pure vanilla extract instead of a vanilla bean. $10 is a lot for one vanilla bean, especially 1 vanilla bean that I might mess up. There was so much batter. The recipe said it would make about 30 cupcakes, and I didn’t think about how many cupcakes that actually was. Think about it–that’s a lot of cupcakes. 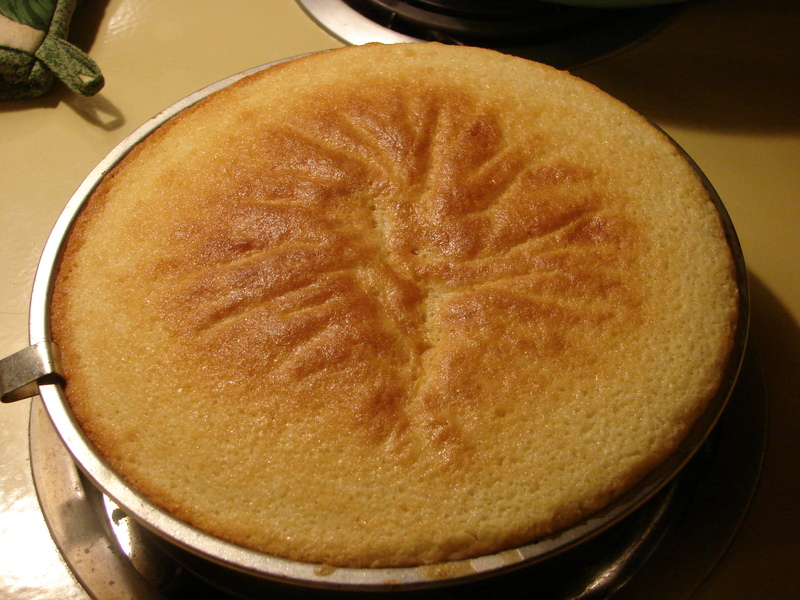 I had decided to make a round cake, thinking it would consist of 2 layers. 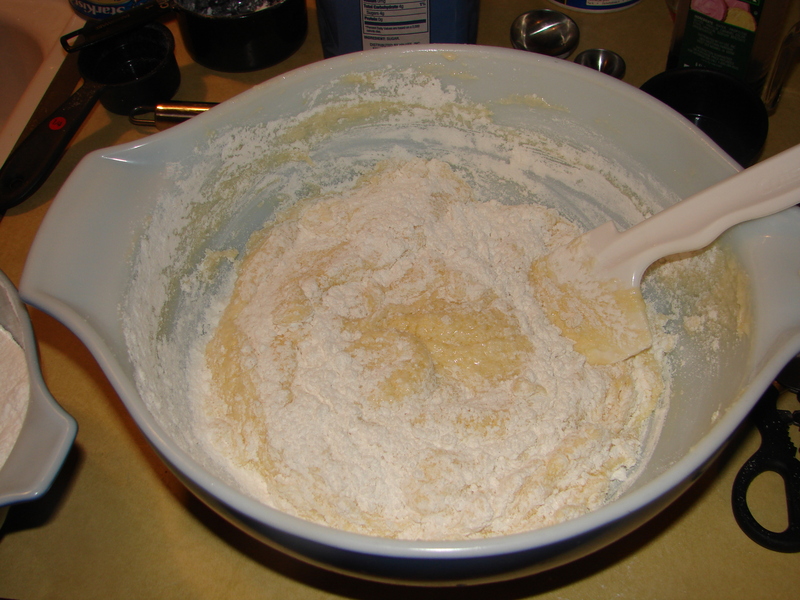 After I poured batter into 2 9-inch pans, though, there was still a lot of batter. So, I filled the pans really full and then did what I normally do when I’m freaking out about something that isn’t that big of a deal: called Molly. Ultimately, it was fine (as most things usually are). There was just enough batter for 3 layers–1 thin layer sandwiched between 2 taller ones. In the afternoon on my birthday, I frosted the cake. I used the recipe at the bottom of this page: http://annies-eats.com/2008/03/08/happy-21st-birthday-bro/. I did change it up a bit because I wanted the cake to be a little thicker and a little whiter than the recipe made it. So I just kept adding heavy whipping cream and powdered sugar. 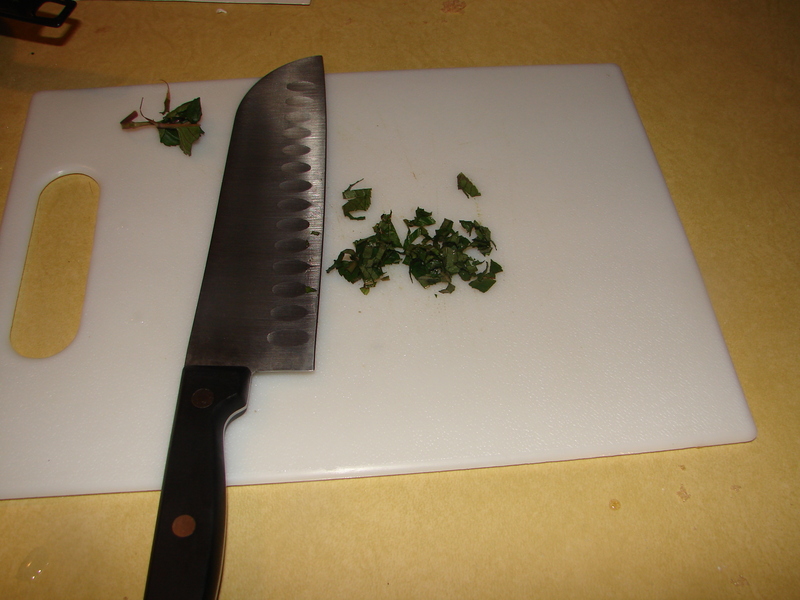 The part where the chocolate mint comes in: After the cake was frosted, I added two leaves of mint for garnish. Lovely. Since I didn’t invent this cake or anything, I guess I don’t need to feel bad about bragging: it was delicious. There wasn’t any left. I guess that’s what happens when you make a delicious cake. Or when there are 40 people at your party. 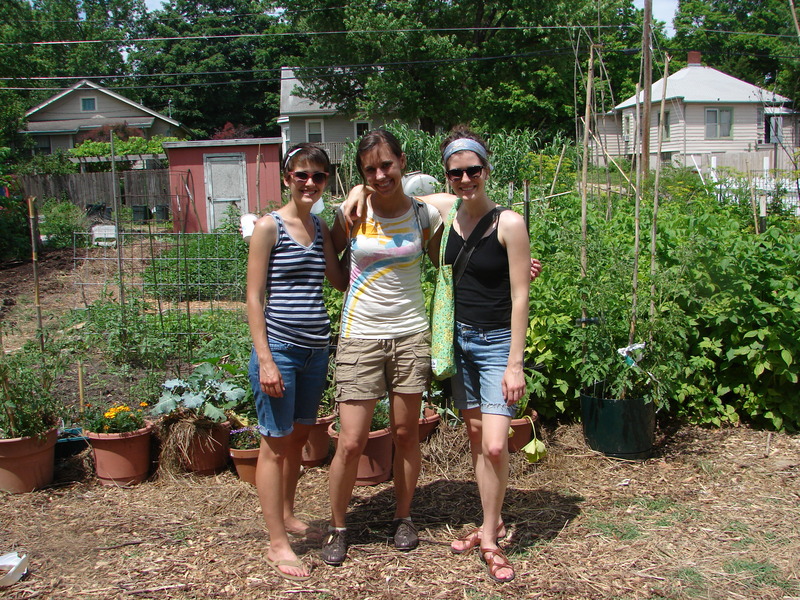 As I mentioned in my last post, Saturday June 5th was the Lawrence Food Garden Tour. From 9 to noon, people could go on this self-guided tour to see 18 Lawrence gardens. It wasn’t possible to see all 18 gardens in 3 hours, but there were lots of options. Because our garden was on the tour, we had to be there the entire time (“had” implies obligation…really it’s more of a “got to be there” kind of thing). Unfortunately, we didn’t have many visitors (maybe 12), which was kind of surprising considering how close we are to downtown and the great weather on Saturday. Since we only had a few tours to give, we accomplished quite a bit: planting tomatoes, clearing out a new spot for planting, weeding, making a mosaic, protecting snails, and building a scarecrow. Part 1 covers all of this; this is a mostly photo blog as things like hammering don’t require a lot of explanation. Finished product. Kind of funny. Also kind of creepy. We used cinder blocks to help it stay up better. It’s pretty heavy, though, so I’m still a little concerned that it’s going to topple over in a strong wind, crushing the spinach and cucumbers and tomatoes in its path. We’ll see… The perfect end to the morning: Katie and JNish. They had visited 8 gardens on foot. They also had lots of stories and free fresh produce. They were probably more tired than I was. And maybe more excited. 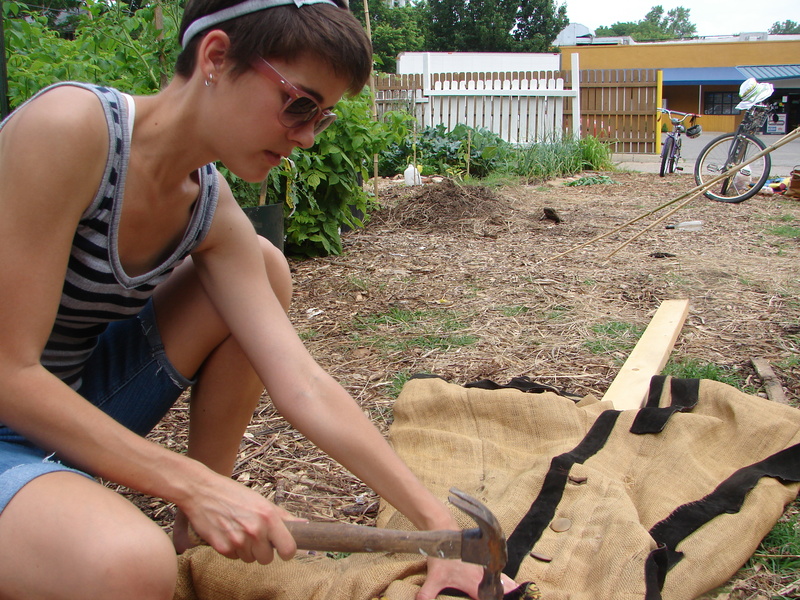 Big week in the community garden. We’ve gotten quite a few comments about how great the entire garden looks this summer from residents who live nearby. One woman did comment, though, that the outside of the garden could use some work. She was right–there were weeds, flowers that had taken over, a mulberry tree, and grapevines. It was a lot to take on. She commented that cleaning up the outside might keep people from sitting inside it and drinking the beer they bought at the liquor store next door; I’m not sure that this is true. Some youth volunteers at the Roger Hill Volunteer Center wanted to help us rebuild the fence. Another volunteer from the community (a guy named Bruce) was in charge of overseeing this fence-building project, our fence-building expert. 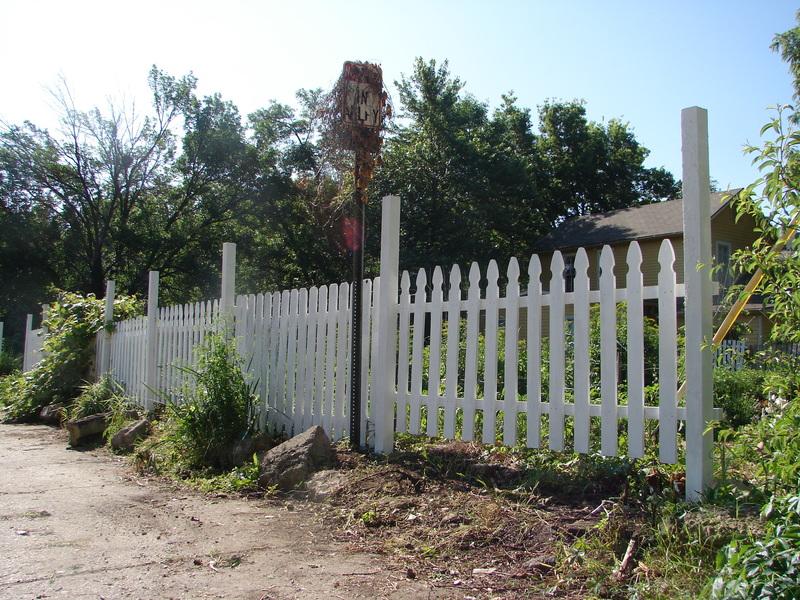 Before we could build a fence, though, we had to tear down the parts of the old one that weren’t salvageable. When I started doing this on Saturday, I didn’t think I would be very successful, but in two entire sections of fence, there was only one piece of wood I couldn’t tear out. I never thought I would be into destruction, but it was really fun. Then I tore out a bunch of weeds. Then I got hot and tired and hungry, so I went home and ate lunch. We met up with Bruce on Sunday night and spent a little over an hour pulling nails and screws out of the rotting wood before the rain caught us. On Wednesday night, the youth volunteers worked from 4:30-7. They were all middle-school girls. They were really quiet, nice, and hard-working. One boy came later; he seemed nice and hard-working, too. While they worked with Bruce rebuilding the fence, I worked with Rachael (the girl in charge of the garden) and her mom, Jen, painting some of the other sections. White. I had to leave early that night, and I honestly didn’t think the project would be finished, but when I went back Thursday morning, it was. Unfortunately I don’t have any before photos…only the after. 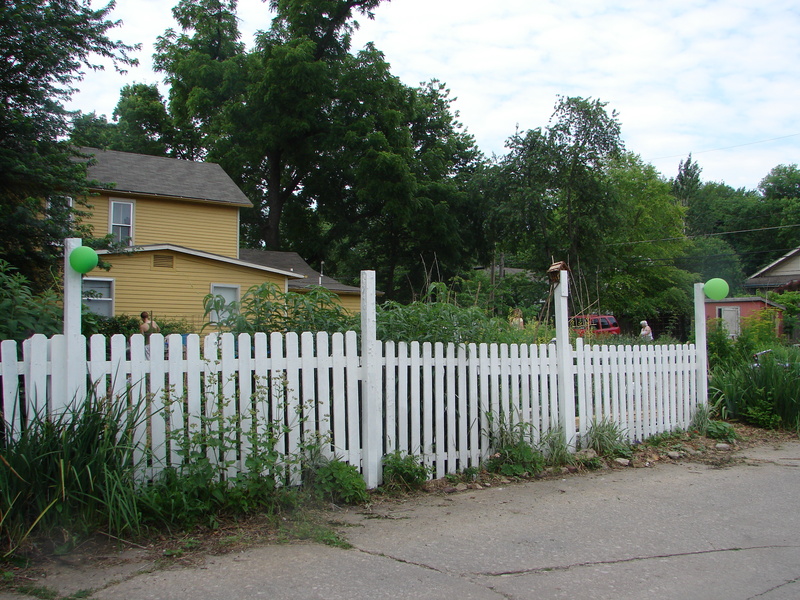 However, if you look back through previous photos in the blog, you can probably see that parts of the fence did need some major work. A lot happened in the garden in April and May. A lot also happened in my life/school/teaching (slashes because they all seem to run together). No time for the blog. It is now summer. I am taking no classes. I am teaching no classes. I am also unemployed…well, mostly unemployed. My 12.5 hours a week on campus will keep me well below the poverty line. Needless to say, I have a lot of free time, hence the 10 blog entries in one week. Everything I’ve written up to this point has been me catching up for April and May. We’re all done catching up now, though. We are now in real t ime. These photos are from this weekend. We got rain last night, so everything probably looks even better today (Who am I kidding? I say “probably” as if I didn’t stop by the garden this morning–I did). Rain is good. It means that Amelia and I don’t have to bring water in plastic water bottles, canteens, and applesauce containers. 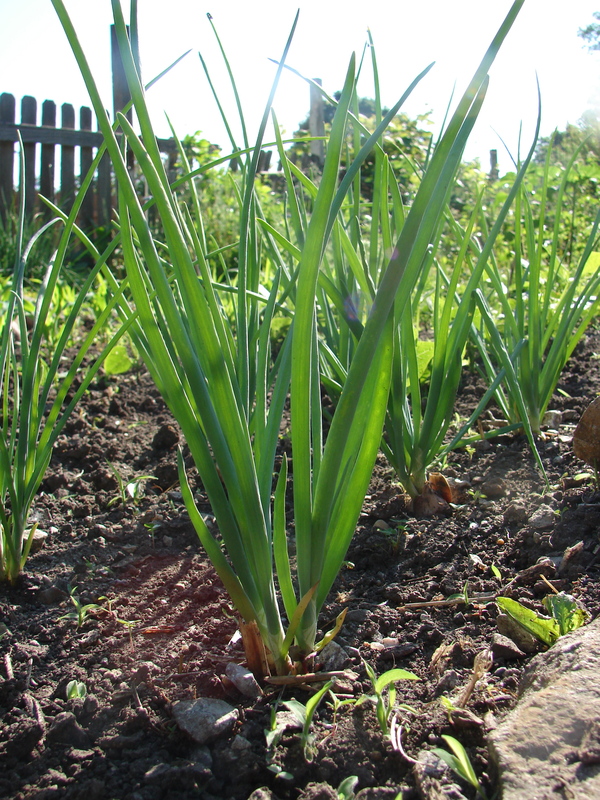 The shallots Amelia planted are doing great. They were the first thing to come up in the garden. What I know about shallots I’ve learned this summer, so I’m waiting for Amelia to make the call on when they’re ready, and how we go about harvesting them. The corn makes me proud, which is good considering the adamance with which I have defended it. In some places all three of the seeds we initially planted in the holes came up. I need to call Grandma and find out whether or not I need to thin them out. I think the answer is yes. On Saturday I met this guy who explained a way that I can make the corn successful–pollinating the corn by hand. He said that when there are only a few rows, the corn sometimes needs help with the cross pollination…the wind’s not enough to make it work. More information about this hand pollination thing to follow. We already have four, count ’em four, tomatoes that are about the size of my fist, maybe a baseball. There are two on each plant, and their progress is impressive because last summer, my tomatoes didn’t look like this until the end of June. 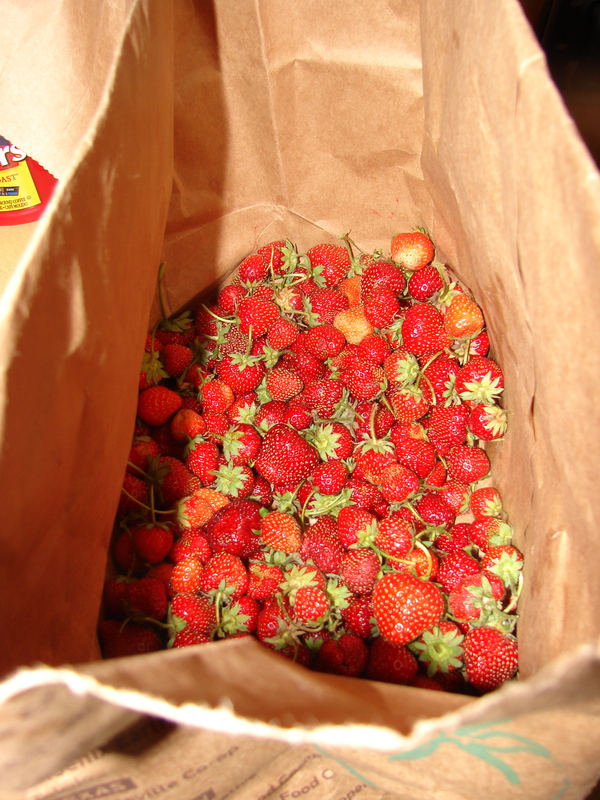 Amelia bought them at the Farmer’s Market, so we should probably thank that farmer for selling us a phenomenal plant. Rachael (the girl who coordinates the garden) said that we had the first tomatoes, and that pretty much everyone else has noticed that.